Jazz vocalist Lori Carsillo sounds like she’s smiling when she sings. She has a gorgeous voice, like velvet, with a shivery vibrato. On her new album, Sugar & Smoke, she covers songs that were done four or five decades ago by the likes of Julie London, Tony Bennett, Abbey Lincoln, and Mel Tormé. “They all sort of fall in that sort of 1960s feel. That’s kind of where my head was at. I mean, I love that era, the cocktail ’60s era of jazz. It was such a great time, at least from a music standpoint — and for the clothing, of course.” The Santa Fe Music Collective presents Carsillo in concert on Friday, April 11, at the Museum Hill Café. Joining her are Bert Dalton on piano, Jon Gagan on bass, John Trentacosta on drums, and Arlen Asher on reeds. As a youngster, Carsillo studied classical music and opera, learned to love jazz standards, and had some exposure to musical theater. “Old Devil Moon,” one of the songs on the new album, is a tribute to her mother, who once sang it in a production of Finian’s Rainbow, according to the liner notes by jazz commentator and author Scott Yanow. early 2000s, Carsillo has worked her repertoire of jazz standards and less-known songs at Café Claude in San Francisco. She also plays the lounge at Yoshi’s. Francisco, but the mastermind work,” she said with a laugh, “happens in my home office.” Several of the songs boast fine piano solos by Adam Shulman. 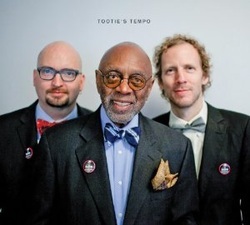 Filling out the rhythm section are Mike Bordelon, bass, and James Gallagher, drums, and there are occasional contributions by vibraphonist Smith Dobson, altoist Riley Bandy, and guitarist Jay Stapleton. “While my choice of tunes, all of which I love, veered in the direction of the 1960s, my goal was to create modern versions of those songs with a mellow vibe that listeners would enjoy,” she says in the liner notes. Included on the album besides “Cinnamon & Clove,” best-known in a version by Sergio Mendes, and “Grass Is Greener,” a Carsillo fave sung by Blossom Dearie, are “In the Wee Small Hours of the Morning,” which recalls Frank Sinatra, and “Nice Girls Don’t Stay for Breakfast” by Julie London. Let’s get one thing straight right now—John Trentacosta is awesome. 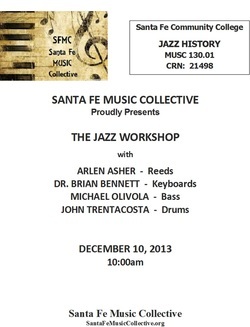 The longtime local drummer, public school music teacher, KSFR DJ and now college professor just gets it, Santa Fe. Y’see, as a studied and multi-faceted musician, Trentacosta has not only found success as a session musician and solo artist, but he has dedicated a rather large amount of his time to founding and facilitating fledgling non-profit Santa Fe Music Collective and providing instruction, entertainment and education to music lovers of all ages. It’s kind of like the guy loves jazz and rock so much that he has no choice but to share this love in a profoundly inclusive manner. As we speak, Trentacosta is gearing up for the third session of his Santa Fe Community College class, History of Rock and Roll (Music 135; CRN #30763). He had already been in front of a classroom with the similar History of Jazz class, but this branching out of curriculum and addition of rock history goes a long way toward providing a more intensive experience and education. Certainly jazz and rock music have deep roots in both blues and African American tradition/history, and Trentacosta’s ability to delve into each area in a separate yet immersive way is huge. Once he decided to indeed teach the class, it became a matter of weaving more than just the stylistic and historical elements of the musicians themselves into a lesson plan. Trentacosta is a selfproclaimed “very political guy,” it was important to examine the sociological aspects of the associated time periods and their cause and effect implications on the music itself. As such, Trentacosta implements author Reebee Garofalo’s 2011 book, Rockin’ Out. It’s a chronological overview of the historical goings on that ran parallel to musical milestones from the invention of the phonograph to the ever-changing landscape of a post-internet musical world. Trentacosta himself is a talented musician best known for his work with local-ish jazz act Straight Up. It’s his working knowledge of the nuts and bolts of music that provides a more in-depth view when it comes the highlights of rock. Should you need proof of Trentacosta’s drumming or musical expertise, he’s taking part in an upcoming perfor mance for the St. John’s College Music on the Hill Elevated series alongside vocalist Kathy Kosins, pianist John Rangel and bassist Andy Zadrozny. All proceeds will benefit the school’s scholarship fund. 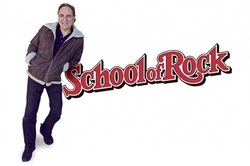 In the meantime, think about taking the History of Rock class. Whether you’re a know-it-all with a desire to test your knowledge or even just a vaguely interested party, this is one of the cooler ways to get that college experience. fine musicians to perform a Workshop for this final class.